One of the few features that is no longer available to us since our migration to eThink is the Moodlerooms Grader (better known as Joule Grader). The Marking Manager block approximates the Moodlerooms Grader in many ways, although it does not facilitate forum grading. Faculty can see this block, but it remains hidden from students. 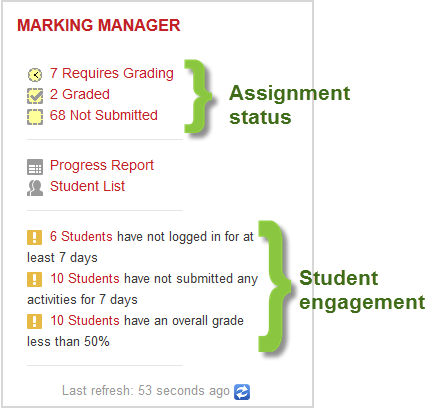 One of the advantages of the Marking Manager block is that it not only provides a recap of assignment status for the entire course, but it also displays a snapshot of student engagement. Clicking on the links provided shows you which students have not been active and reports when they last logged in. By default, the block informs you that students are failing if their gradebook score is less than 50%, but you can adjust that number as you wish by configuring the block. 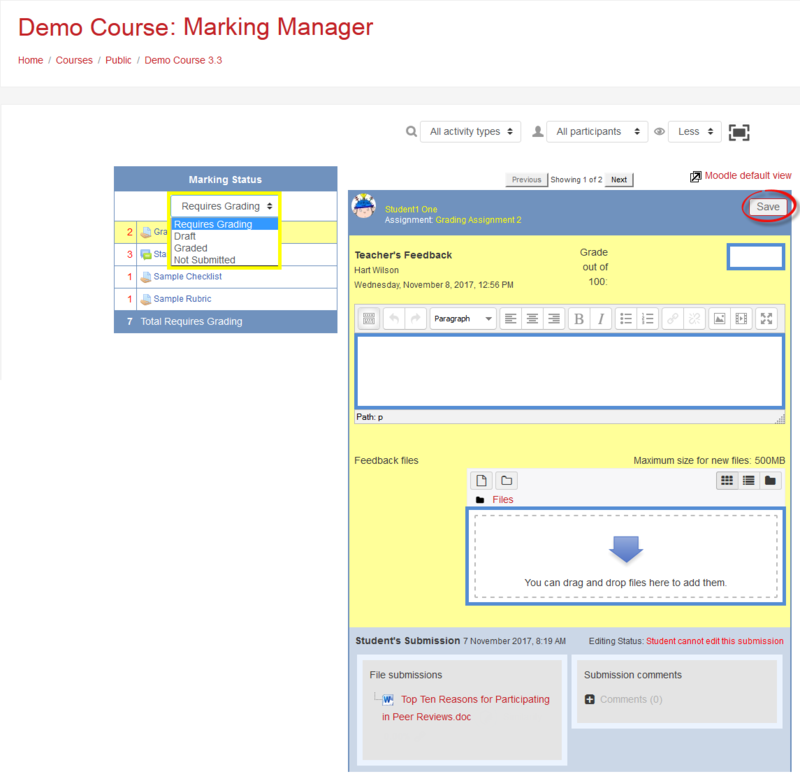 To add the Marking Manager block, turn editing on in your course. Scroll down the navigation panel on the left and click on the Add a block link. Click on NED Marking Manager to activate the block. Don't see the navigation panel on the left? Click on the "hamburger" icon in the upper left corner to expand the panel. Don't see any blocks on the right? Scroll down past the last section in your course or zoom out to reduce the width of the central area of the course main page.